This bright and easy breakfast packs two servings of fruit plus soy protein and fiber. 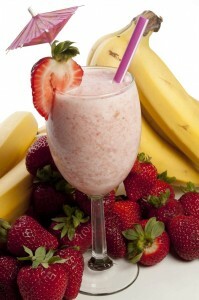 Combine orange juice, banana, berries, tofu and crushed ice in a blender; cover and blend until smooth and frothy. Sweeten with sugar, if desired. Serve immediately. Tip: An easy way to crush ice is to place cubes in a heavy-duty plastic bag and break them with a rolling pin. Per serving: 135 calories; 2 g fat ( 0 g sat , 0 g mono ); 0 mg cholesterol; 27 g carbohydrates; 0 g added sugars; 4 g protein; 3 g fiber; 19 mg sodium; 376 mg potassium. Nutrition Bonus: Vitamin C (93% daily value). © 2019 Weight loss encyclopedia. All Rights Reserved.